(Newser) – Firefighters at Disney World were warned to stop feeding alligators two months before a gator killed 2-year-old Lane Graves, according to employee emails. Emails from employees of Reedy Creek Emergency Services—which operates inside the park—show firefighters had been feeding at least one of two gators apparently living in a pond near their fire station, less than a mile from where Lane was killed, reports the Orlando Sentinel. One alligator was believed to be four or five feet long, and the other was a juvenile. In one email to the fire station's commanders, a communications rep said an alligator had been spotted near the station where communications staff parked their cars, and some "expressed concern of becoming alligator food. 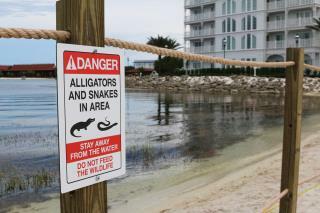 ... (C)ould you ask your crews to stop feeding the gator." The last report I read stated that the child's recovered body had no marks. Is this correct? "The administrator is skeptical because they would have had 'to travel across a couple roadways' to get to the Seven Seas Lagoon near the Grand Floridian Resort & Spa, where the June 14 incident took place." That administrator is a numbnut because I've come across a gator once a mile or two from any body of water (save for enclosed swimming pools). No swamps/wetlands either. It was on the Lake Wales Ridge (AKA the Central Florida "Alps"), just a few miles west of WDW, and US-27 was a few hundreds of feet away (back when it was all groves rather than an endless sea of housing developments). They'll go however far they need in order to find a body of water that they can call their own (or a part of that body of water if it's big enough). And June is the time when they rove around the most. The only thing that stops them is if the ground is too hot. When that happens, if they can't get too water soon they'll just sort of hunker down, preferably in soft ground and in the shade of brush to keep the sun off them until they're cool again. Yes, despite being cold-blooded (a bit of a misnomer, they just can't self-regulate their body temps like birds and mammals), they can get too hot. Which explains that during the hottest months of the year, they tend to be active at night so that they don't overheat. And gators definitely cross roadways. I remember a story from a few years ago when a gator actually was struck by a vehicle, but not hard enough for it to get killed, so it actually clamped-down onto the bumper or tire and wouldn't let go even though it was dragged for a bit until the driver could stop. And then it wouldn't let go until the trappers came. "illegal to feed alligators in Florida". Silliness ensues. Walleytown is not Florida, its a whole independent country. Heck, I've seen Mexican, Chinese, German, French, Italian, Indonesian, Turkish, Indian, and Mayan people working there. Those people would not want to live in Florida.